I am the complete opposite of a morning person. I try and avoid getting up until I have no other choice, or I’ll be late. You’ll probably never see me at an early morning yoga class, or sweating my bum off in the gym before sunrise. No, no. You’ll find me under the duvet, having pressed snooze for the 11th time. When I finally roll out of bed, I rush through my morning routine and somehow manage to make it out on time (almost) every day. Of course, we all have our bad days when everything goes wrong, but hey ho! So if you’re anything like me and try and squeeze in as many extra minutes in bed each morning, I’ve got a few tips which help me start the day right, even when I’d much rather be in bed. And it all starts the night before. Get everything ready in the evening, so you can make the most of your bed in the morning. I am terrible when it comes to picking outfits in the morning. I swear when I look at my wardrobe in the morning, I never see anything I like. I’d take half my clothes out, get stressed, get upset I don’t have anything I want to wear (and trust me, I do!) and my day is already ruined. So I started prepping my outfits the night before. 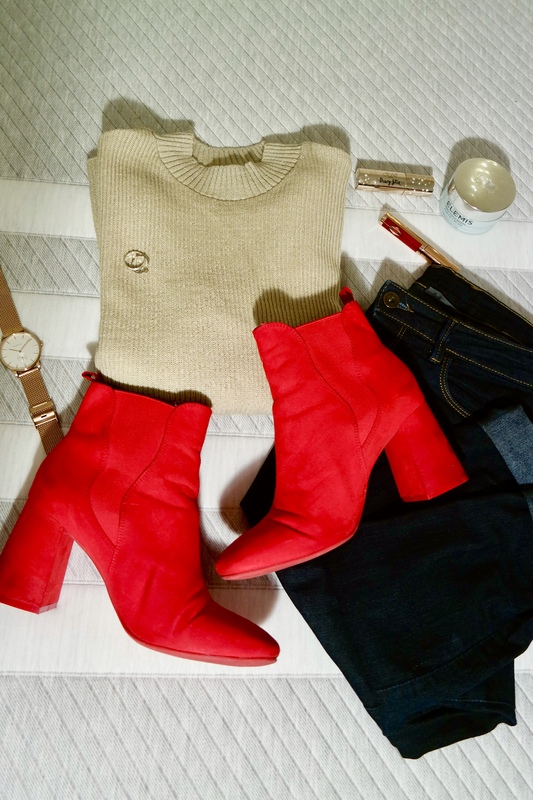 I’d check the weather forecast before starting to think about what to wear, then I’ll look at my calendar to see what I’ve got lined up for the day. I’d take a few options out, maybe try them on if it’s something I’m not sure of and can be bothered, and leave the winner out, ready to be put on in the morning. I find it so much easier making a decision when I’m not stressing about being late, and in the morning, I just have to put the clothes on and I’m ready. Another thing that saves me a ton of time is having the products I’m currently using lined up on my mantelpiece with the morning ones right at the front. Having a super easy routine and not wearing makeup helps with saving time, to be honest. After I roll out of bed, I brush my teeth and wash my face, and then jump straight on to skincare. Tone, serum, moisturiser and sunscreen and that’s it. If I feel like I need to put some makeup on, I’d either put that out the night before as well or decide what I need and find it while I’m brushing my teeth. Multi-tasking is my jam (sometimes). Breakfast is the most important meal of the day, we all know that. I get ready in about 20 minutes in the morning, so I don’t usually have time to eat at home, but that doesn’t mean I skip it. Sometimes, I’d make a sandwich in the evening and eat it while I’m waiting for the bus, but most days I have a bowl of porridge at work. If I’m lucky and am staying home that day, then I’ll have something fancy like toast or a smoothie. A good night sleep is a necessity for a good day ahead. You know, because you need to recharge your batteries and your body needs to prepare for the new day. Here are three things that help me sleep better. Start telling your body it’s bedtime a bit before you actually go to bed. Have a warm shower, turn the lights off and light some candles to set the mood and make your room cosy. This way you’ll start to relax and prepare for a restful sleep. Since I moved to the UK, I’ve lived in lots of different places, each one coming with its own bed. I’ve learned that having a good mattress to sleep on really makes a difference. When Leesa* got in touch with me regarding a collaboration I didn’t think twice. 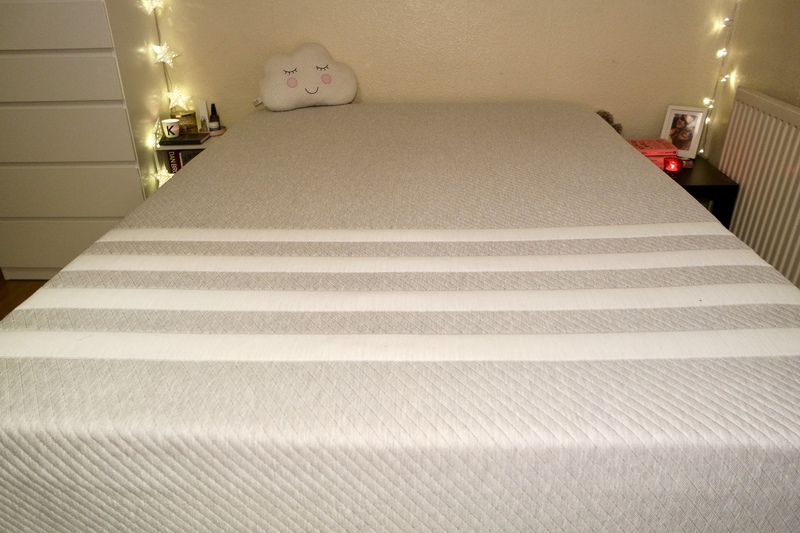 I’d never had a mattress of my own because when you’re a student you can’t really afford it, and you move around so much that it’s not so practical. But now that I’m an adult (sure), I felt like it was time for an upgrade. So about a month ago, a massive box arrived, and inside this box was my best sleep ever. The mattress is made up of three foam layers – cooling foam, pressure relieving memory foam and then a dense core support base layer. It adapts to the way you sleep, so whether you’re a back, stomach or side sleeper, the Leesa mattress will support you and you’ll be comfy! I’ve been sleeping a lot better during the past month and waking up without feeling stiff or having shoulder pain. And if you wanted another opinion, after the first night Simon and I slept on my new mattress, he said that’s the best sleep he’s had in my bed. So there we go. A double mattress will cost you £650, which definitely isn’t cheap, but think of it as an investment. 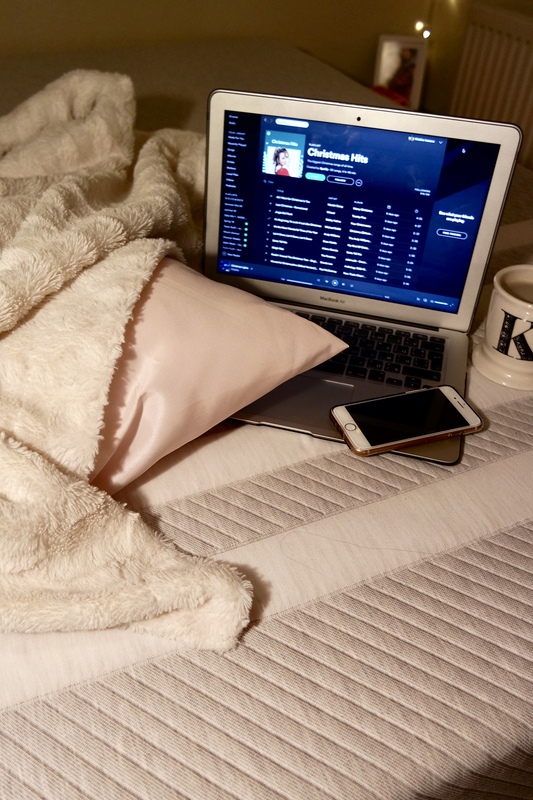 You spend a lot of time in your bed, so it’s a good idea to make it as comfy as possible and make sure you get your beauty sleep without any side effects. And if you don’t get along with it, you can return it within 100 days. Leesa offer a 100-night risk-free trial period. 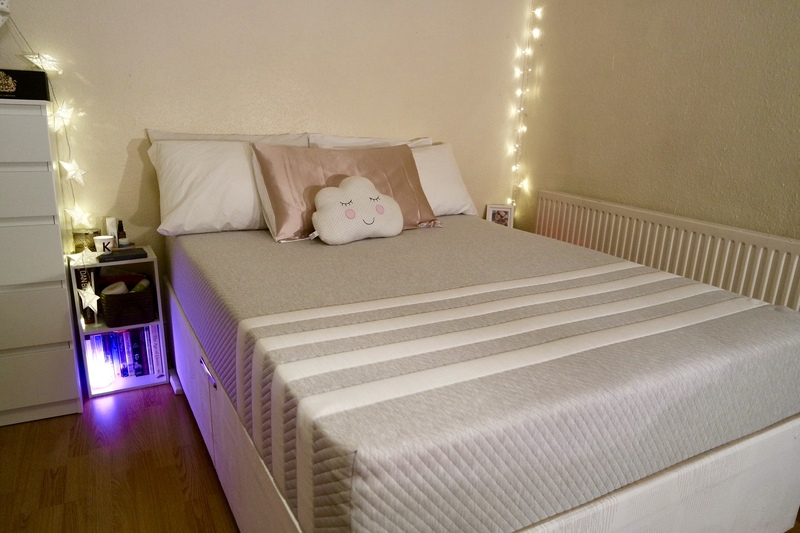 Which means that if it isn’t working out for you at any point in the first 100 nights of receiving the mattress, all you have to do is get in touch with them and they arrange for the mattress to be collected and donated through a charitable organisation. Giving back is actually built into the company’s DNA. For every 10 mattresses they sell, they donate one to a charity, so by getting yourself a good night sleep, you’re helping someone else get a good night sleep too. And, for every mattress sold, the company plants a tree. How cute is this?! 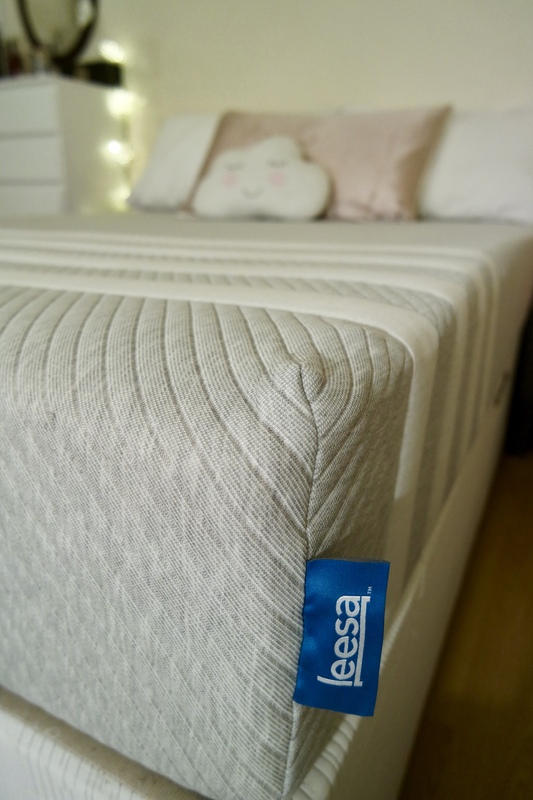 Leesa operates exclusively online, so if you want to get your hands on a new mattress, visit their website here. Get £100 off when using the code ‘GINANDBISCUITS‘. I listened to a talk by a sleep expert, so this is his tip – write down what you have to do the day after so that you don’t think about it when you go to sleep. Overthinking and planning can disrupt your sleep (shocking! ), so make a little to-do list for the next day. This way, your brain won’t be busy thinking about all the things you have lined up for the day ahead so it can rest. *This post is in collaboration with Leesa. The mattress was gifted to me, but all images, sleep and views are my own.